At Cannes Lions 2017, AI was one of the hot topics at the Palais and on the Croisette. 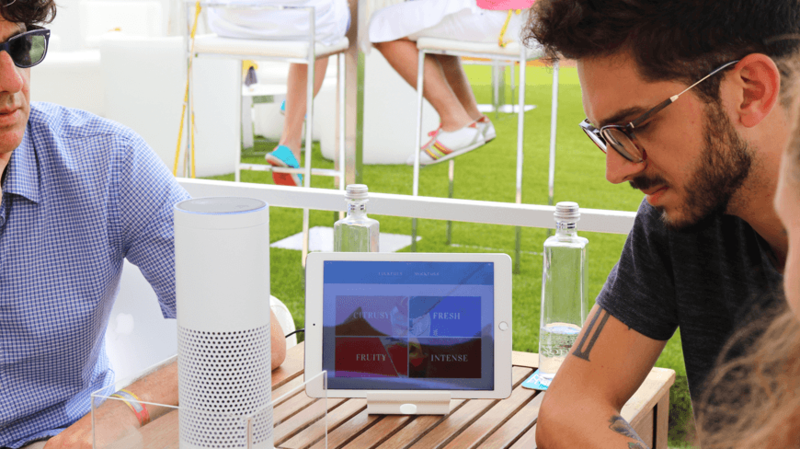 Throughout the week, Isobar, iProspect and Diageo demonstrated The Power of Voice through an exciting Alexa skills experience hosted in the Dentsu Aegis Beach House. Movers and shakers from across the advertising and technology industry poured into two beach cabanas which offered an exclusive opportunity to be part of a voice experience, built especially for the festival. The technology for the skill was developed by Chandra Raju, Technical Developer at Isobar U.S and Victoria Aiello, Technical Developer at Isobar World Sourcing, Brazil team. Guests including Dentsu Aegis CEO Jerry Buhlmann and Syl Saller, Global CMO for Diageo, were invited to select drinks designed by award-winning mixologist, Rob Poulter, from specially crafted cocktails menu using Alexa. Drinks included gin based cocktails such as Elderflower Fitz and Negroni and mocktails such as Seedlip Spring Garden and Seedlip Spiced Apple. Alexa then used taste and contextual triggers to promote discovery, aid recommendation, and assist with ordering. Guests then received their drinks at the table without interruption to their experience. More than a product innovation, the project is a test and learn initiative developed in partnership with Diageo, Amazon and iProspect to explore the convergence of voice technology with the human experience. The team ran a series of progressive tests to gain insight and data. These analysed a number of scenarios including how narrative triggers influence product choice, staff/machine collaboration, and levels of AI value across a range of scenarios. “We’re exploring where the optimal intersection between human interaction and machine effectiveness lies within this specific environment. Where can we create a better experience for people, and create value for the business.” said Matt Gee, Head of Digital Transformation, Isobar UK. The experiment also gave rise to the areas where advertising specifically needs to evolve its skill base - “The rise of voice has led to an interesting evolution in the craft of writing from copy to conversation,” Matt continued. “We’re at the first iteration, however what we have seen is significant consumer acceptance of voice as an interface led by the Amazon Echo. The important thing is not to think of voice in isolation, but as a connected part of our digital ecosystem.” With the addition of connected cameras and screen in Amazon’s new voice products the ‘Look’ and ‘Show’, we will be seeing a new wave of consumer and business technologies powered by AI being adopted by brands.